Courses | Butler & Young Group Ltd.
All of our CDM Training focuses at the heart of CDM, the skilful process of Design Risk Management (DRM). DRM is the application of the General Principles of Prevention (PoP) which is the “Art of CDM”. It is not box ticking or creating/using template documents, it is managing design risks so that projects can be built, used, maintained and eventually re-cycled (refurbished or demolished) safely and healthily. Any of our courses can be run “In-House” at a venue provided by you or by us. This can be beneficial for a collective business or corporate understanding of the regulations, as well as being cost effective for 6 or more people. Additionally, you can allocate space for attendance by others so you can recover some of your financial commitment – talk to us about your needs especially if you also need RIBA certification. When you attend one of our CDM Courses you will be offered a free Asbestos for Architects & Designerson-line course. One free course per attendee. This is a onetime offer used once but your purchase is unlimited. This course is aimed at the PD Role. It is a must for all PD’s appointed to the duty holder position for any kind of project. Additionally on our course, you will gain knowledge for providing CDM Advisory Services to CDM duty holders including, Clients, Principal Designers, Designers, Principal Contractors and Contractors. For evidence of your personal SKE and corporate capability you should attend this course if you want to know how to be a PD for any type of construction project. It is not just for architects. Our course concentrates on Design Risk Management (DRM) and the application of the General Principles of Prevention (PoP). You will understand what is required to successfully plan, manage, monitor and coordinate health and safety matters of concern for any kind of construction project. Various examples and exercises are provided to help you understand what it means to control risks through design. This course does not expect you to be a health and safety expert but will provide you with the knowledge of the CDM Regulations and the expectations to discharge health and safety duties. There is a course test. The cost of the 2 day “Principal Designer Course” is £595.00 + VAT. 020 8253 4930 Mobile: 07808 888314. This course gives an overview of the requirements for Clients, Principal Designers, Principal Contractors, Contractors, Designers and Workers, and how the regulations apply to construction projects. It is a very condensed version of the 2 Day course rolled into one. This course is a must have for anyone with a CDM function, even if they do not have a duty holder role. There is no course test. The cost of the 1 day “CDM2015 Awareness Course” is £295.00 + VAT. For more information, email angela.coomber@byl.co.uk or telephone Angela Coomber on 020 8253 4930 Mobile: 07808 888314. Affiliate AaPS – Delegates that successfully pass courses will receive an APS Certificate for attending the course and will be able to apply directly to APS for free affiliate membership. Affiliate membership will be granted by the APS for one year and you will have 3 months (from receipt of your APS electronic certificate) to apply. Membership points – An individual who successfully completes a course may claim points towards membership of APS. 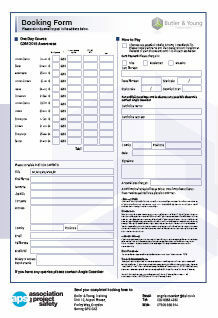 A copy of the CPD certificate must be included with an application. You as an individual working on your own or as the organisation’s specialist representative (Principal) should attend the 2 day PD course. In order to provide evidence of your Skill, Knowledge and Experience (SKE) as a duty holder you should have attended credible training as part of that requirement. This helps you prove to those that might question you that you have the required knowledge and training to add to your experience – construction industry accredited training with a CPD certificate is the best way as part of your proof. In an organisation, the ratio of how many people formally trained to those that are not is a consideration with no absolutes. Please discuss with us how many formally trained “Principals” might be considered necessary within your organisation. If you as an individual believe you have a level of SKE and you require confirmation of your knowledge and formal training then the 1 day course might be considered sufficient. For the organisation to have capability it is a considered expectation that all relevant employees will need evidence of formal training in support of their SKE and your corporate competence. Update training – remember to keep your own and your organisations corporate capability up to date via the individuals SKE+T. Note – Duty of care and Vicarious Liability. The acts and/or omissions of the employee are considered to be the acts and/or omissions of the employer – in their duty of care. The CDM Regulations refer often to “a person” – it is important to note that this refers to the employer (the boss of the company or the board if there is one – the “responsible person”). An employee does not discharge the duty but rather assists the “responsible person” employer (boss) to discharge their duty. If you are self-employed you are the duty holder. This note is not in and of itself the legal definition as that is more complex – this is simply provided to help you initially understand how import the duty of care is to discharging CDM and health and safety duties. You will know more after attending our course. Delegates that successfully pass either of our 2 Day APS Accredited courses assessment and test will receive an APS Certificate for attending the course and will be able to apply directly to APS for Affiliate Membership. Affiliate membership will be granted by the APS for one year and you will have 3 months (from receipt of your APS electronic certificate) to apply. Of course, if you have the necessary evidence of skill, knowledge and experience you can apply directly for membership at a more senior level appropriate to your qualifications and experience. An individual who successfully completes an accredited course (one or 2 day) may claim points as allocated in the Qualifications and Experience table towards meeting full membership of APS. A copy of the certificate must be included with an application”. There is a requirement for pre and post course learning to meet the full APS requirements of membership as it is based on your skill, knowledge and experience not just successful completion of our course. Butler & Young are currently designing and filming a number of on-line CDM Knowledge Sessions and CDM Knowledge Packs. This on-line training is predominantly aimed at all those undertaking formal construction related training including degree courses, apprenticeships, a route to professional membership, construction supervision or management training, construction health and safety training, etc. That said, the training will be suitable for anyone working in the construction industry wishing to improve their skill, knowledge and experience. This will help ensure the CDM2015 “organisational capability” of your organisation. A “Taster Session” is now available at the link below. Please get in touch if you are interested in facilitating or supporting our on-line CDM training.